You'll be happy to serve this creamy and colorful chicken casserole. Not only is it easy to make, it's scrumptious! Mix remaining ingredients in 13x9-inch baking dish sprayed with cooking spray; top with stuffing. 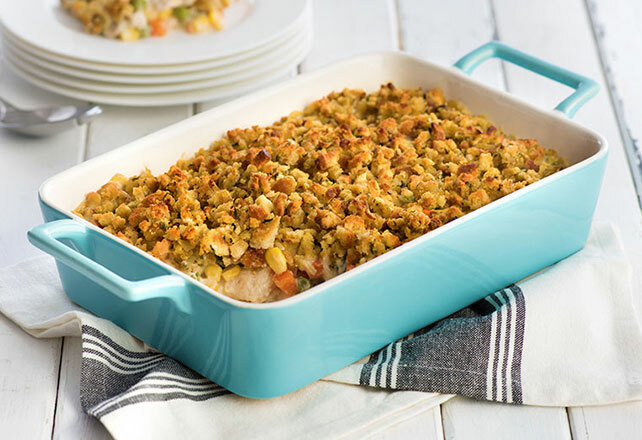 Prepare recipe as directed, stirring 1-1/2 cups KRAFT Shredded Low-Moisture Part-Skim Mozzarella Cheese into the chicken mixture in baking dish before topping with the stuffing and baking as directed. Cool, then refrigerate any leftovers. To reheat, microwave each serving on HIGH 2 min. or until heated through.